Schuman Report 2018, State of the Union. The 9th edition analyses the challenges Europe faces. 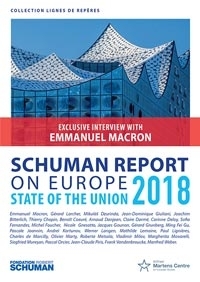 With the contribution of the best experts, an exclusive interview with Emmanuel Macron, President of the French Republic, original maps and commented statistics, the Schuman Report 2018 on the state of the Union offers a complete view of the European Union. The State of the Union 2010. Schuman Report on Europe.